Modern Farmhouse style is everywhere. And, it’s sizzling hot. Whether you are looking through a magazine, reading a blog, watching TV, or shopping at Target chances are you’ve come across elements of this home décor sensation. And, if you live in Austin, there’s no doubt that you are very familiar with our Waco neighbors to the north, Chip and Joanna Gaines. As hosts of the popular HGTV show Fixer Upper, the Gaines’ charming demeanor and farm-country living has taking this decorating trend to soaring new heights. However, there’s also the Internet and over the last several years modern farmhouse has rapidly gained in popularity because of Pinterest. This social media platform phenomenon is primarily a web-based bulletin board where users post saved images called pins found on the Internet. The images are categorized by topic. There’s literally thousands of boards on a wide variety of interests and topics such as recipes, fitness trends, music, wedding planning, and decorating styles and tips. The idea behind Pinterest is sharing. You share what you like and found on the Internet to inspire others and help them explore and discover new ideas and projects. And, just like other popular social media platforms, it’s free to sign up. Step into a modern farmhouse style interior and you’ll feel immediate warmth and charm. It’s the kind of interior that makes you comfortable enough to take your shoes off, kick-back in the kitchen and stay awhile, a long while. Or, spend hours cuddling up in front of the fireplace with a hot cup of tea. It’s a combination of traditional and classic with a mix of time-honored accessories and furnishings. Not to be confused with cluttered and fussy. Think simple and well-thought out. But, it’s also forgiving and adaptable. Which means modern farmhouse lets you create your own personal style. It also gives you some decorating liberty because you don’t have to do an entire room in it. Using just a few key elements in a room can create just enough interest without being overdone. So, in order to understand what this trending style entails, we put together a list of elements and key characteristics that further help define and refine modern farmhouse. The good news about modern farmhouse is that you don’t have to live in the country to incorporate it into your urban dwelling. Whether you want to decorate a bedroom, kitchen, or the entire house, here’s a few interior characteristic of this great style. Neutral colors. Cornflower blue and mauve, the country colors of yesteryear, are out. One of the major characteristics that defines modern farmhouse is a neutral color palette. Creating a neutral color palette is vital to the style. To stay true use whites and lighter shades of blue and green for your paint colors. Cream, beige, silver sage and gray also work well. And, remember neutrals don’t have to be boring. It’s what you put in the room such as great furnishings and heartfelt antiques that will make your room pop. Vintage but modern and balanced. The key word here is “modern.” Modern farmhouse balances the old with the new. So, when layering accessories put together an eclectic mix of your favorite things. For example, in a kitchen keep the look fresh and new by pairing an old scale with decorative plates in the latest designs with neutral colors. Cozy and warm. To create that wrapped in a big comfy blanket feeling modern farmhouse uses a variety of textures. Think reclaimed wood and a mix of metals and fabrics. Cotton, canvas, wool and chenille in light, neutral colors are perfect accents for throws and pillows. Also, try bronze mirrors and wrought iron light fixtures for a classic look. Collected over time look but not cluttered. When decorating it’s important to incorporate those things that you absolutely love. After all, that’s what makes a house a home. So, whether it’s a group of art pieces or a collection of vases you found at a flea market, collections can look cluttered. The key here is to organize your collection in a way that it looks layered but not cluttered. Ultimately you want your collection to set a mood and showcase your excellent taste. To pull-off modern farmhouse you’ll need to know some of the essential elements that make it what it is. 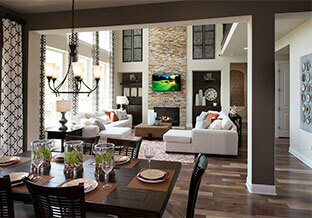 So, before you begin, below are those elements that will help you create the perfect balance between cozy and modern. Mix and match furnishings in bedrooms, living rooms, and home offices. Large wooden furniture can still work, so don’t trash it quite yet. Keep the pieces you love and mix them with up-to-date pieces such as neutral-colored comfy sofas paired with industrial or recycled coffee and side tables. Pine furniture works well too. An open, airy kitchen with large windows is a signature element of modern farmhouse. It should be big enough to fit and feed the neighborhood. Well, sort of. However, to feed all those people, you’ll need a solid-wood farm table. To find one check out local flea markets and resale shops. To complete the look use additional elements such as Shaker-style cabinetry, wood-block countertops, wrought-iron light fixtures and hardware, and cozy rugs. You’ll also need open shelving to display your antiques and a large farmhouse style sink—two additional elements of the style. Wood is a key element and nothing defines modern farmhouse more than using wood. From hard-wood wide plank floors with natural-looking woodwork to exposed beams to reclaimed wood tables, sideboards and chests, use wood to tie it all together. Bring the outside inside by using organic materials. After all, modern farmhouse is all about connecting to the outdoors and keeping things fresh. To achieve some amazing results incorporate natural materials such as stone, rattan, and wicker. Use stone to accent a large focal-point fireplace or accessorize with a wicker chair and some rattan baskets. Finally, whatever elements you choose to use, it’s all about creating your own personal style and have a great time doing it.